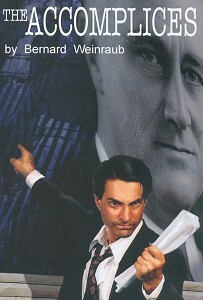 The failure of the American government, media and the Jewish establishment as well to try and save European Jews from being murdered in Hitler's concentration camps is the subject of THE ACCOMPLICES, Bernard Weinraub's provocative and compelling docudrama at the Fountain Theatre (directed by Deborah LaVine). Working from historical records and books, Weinraub, a former political reporter for the New York Times, has fashioned a play that is seething with anger and resentment at the way the USA failed to prevent the Nazis from slaughtering six million innocent men, women and children. Weinraub focuses his sprawling, large-scale recreation of the real events that took place between 1940 and 1944 on Peter Bergson (Steven Schub), a young Lithuanian-born Zionist who first came to the U.S. to sound the alarm about Hitler and to try and help put together a Jewish army to defeat the Nazis. But when news of the German extermination camps came out, Bergson's focus shifted and he began a relentless campaign to rescue European Jews. In the play he is aided by a Roumainian emigre, Samuel Merlin (William Dennis Hurley), a pretty American girl, Betty (Kirsten Kollender), and by a Hollywood screenwriter, Ben Hecht (Dennis Gersten). Together they begin to badger such prominent Jews as Rabbi Stephen Wise (Morlan Higgins), Henry Morganthau (Gersten, again), and Samuel Rosenman (Gregory G. Giles) into taking action. Since all three were close to FDR (James Harper), Bergson hoped that they would persuade the president to use his considerable power and prestige to mobilize public opinion--and military might--in an attempt to stop the mass killings. Unfortunately, the opposite happened. The Jewish establishment (including Hollywood moguls, the New York Times and leading educators) remained silent (fearing an anti-semitic backlash in the U.S.). On top of that, a rabid anti-semite in the State Department, Breckenridge Long (Brian Carpenter), did everything he could to help Hitler rid the world of its Jews. FDR doesn't come off much better in Weinraub's angry, muckraking and tragic play. (5060 Fountain Ave, call 323-663-1525 or visit fountaintheatre.com).